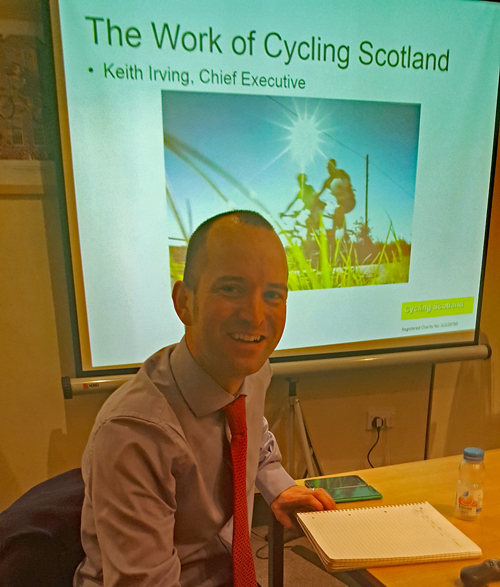 Keith Irving, Chief Executive, Cycling Scotland. Keith came to Cycling Scotland two-and-a-half years ago from Living Streets. Cycling has seen a huge increase in vehicle-km these last ten years, but Scotland has a long way to go before any of our cities, even Edinburgh, can catch up with Cambridge. The Play on Pedals partnership with Cycling UK, Play Scotland and the Glasgow Bike Station has provided a campaign teaching nursery pupils how to learn to cycle without stabilisers. Then the Bikeability Scotland programme with teachers and local authority cycling officers takes learning about cycling into Primary 1-4 classrooms, with on-road training by Primary 6 and 7. Pupils learn how to risk-assess junctions and that assuming the primary position and always being at least 75cm away from the gutters is the most important thing in ensuring their visibility and assertiveness against other road-users. Thirty-three thousand pupils received such training in the last academic year. Training offered by Cycling Scotland is also about getting adults back on their bikes, with practical cycle-awareness offered to PCV and HGV drivers as part of their Continuous Professional Development - 20% of Edinburgh participants applied to join the Cycle to Work scheme offering discounts on purchases of bikes and accessories. HGV collisions with cyclists are low in Scotland compared with London, and increasingly it is the lightweight vehicles such as white vans that are involved in accidents here with cyclists - these doubled to 10% of all cycling accidents in the decade to 2015. Cycling Scotland�s position is that helmets are a matter for personal choice, wearing a correctly-fitted helmet may reduce injury in the event of a crash. Making them compulsory would reduce the number of cyclists, reducing health benefits across the population. Cycling is the most polarised issue in transport, and much decision-taking is anecdote-based, so Cycling Scotland strives to come up with the evidence for a more rational approach. Even in the Netherlands where cycling is the predominant mode for distances of one or two miles, numbers decline over greater distances as public transport or the car are preferred. The "Designing Streets" manual aimed to be transformative in its impact. 12% of Edinburgh residents cycle to work regularly, with Glasgow reaching half that proportion owing to strong pockets of cycling on the South Side and West End. There is no doubt that confidence grows as cycling becomes more visible, however dedication of roadspace is hugely contested because it takes away space from other road-users. It�s important for drivers to learn that a cyclist must be given as much space as if s/he was in charge of a car? Cycling Scotland tries to avoid referring to "cyclists" since every road-user is a person. Operation Close Pass trialled in the West Midlands with plainclothes police wearing cameras has colleagues radioed ahead to pull in drivers who pass cyclists too close, and will be coming to Edinburgh in April. Advanced stop lines can be found in Edinburgh and at new junctions in Glasgow. Cycle Friendly Employer grants assist firms and campuses to create conditions for safe and comfortable cycling, including safe parking, showers and discounts on bikes, helmets and lights, and have seen cycle usage reach 12% at Glasgow Caledonian and double in recent years at the University of Dundee. Cycle-friendly schemes in schools promote cycling as part of the Curriculum for Excellence , teaching pupils cycle-maintenance and helping overcome a view that while cycling at school may be cool, it is not cool to cycle to school. Cycling can also be promoted as a social enterprise, with the Bike Station making cycling affordable by providing cheap recycled bikes. Two new themes are bike-share, helping contribute to London�s economic success and got under way before the economic crash in Dublin, and e-bikes for the longer-distance journey or the not so fit, but care must be taken not to crowd out routes like canal towpaths with too many user-types that can result in conflict between the slowest such as walkers and those who want to go fast. Cycling Scotland's greatest annual event is Pedal for Scotland, begun in 1999 on public highways, which has grown into a major media occasion with a charity partner and last year became entirely traffic-free for the first time, with a contractor paid to close roads to other vehicles. An international comparisons study has shown that no country has made progress without reallocating roadspace - just relegating bikes to a litter-strewn strip "protected" only by a white dotted line simply won�t suffice - and a progress report looks to what would be required to achieve 10% modal share by 2020, attracting people out of their cars since it is not about displacing walking. Links with rail need safer routes to stations. The 1.2% of journeys identified as having cycling as the main mode underplay the experiences of major employers, and in Moray cycling has reached 7% while two Inverness wards have among the country�s highest proportion. It was a Cycling Scotland subsidiary that designed the Bear Way segregated cycle-track in East Dunbartonshire, an eye-opener of an experience since design had to compromise with a need to minimise loss of parking spaces , and the present route provides safe cycling over one and a half miles - but with conditions suited only to advanced cyclists at either end. A report due in the next month will identify the value to the Scottish economy of cycle tourism. Report and photograph of Graham Whiteley by John Yellowlees.